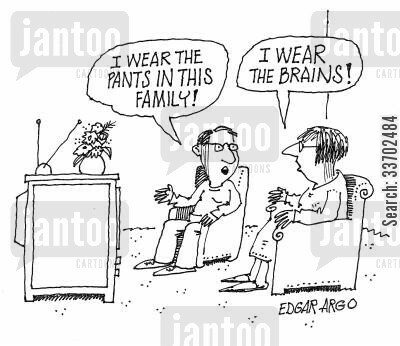 What does it mean when the wife in the picture says “I wear the brains in the family.”? I saw this picture on the internet, and I can't really understand the meaning of "I wear the brains in the family" used by the wife in the picture. I know the husband said "I wear the pants in the family' means that he is in charge in the family. So the wife responds to him by saying she wears the brains in the family. Does it mean that she is the head of the family? The image depicts the woman mocking the man by using the form of his idiomatic expression to return fire, claiming that she's the intelligent one in the family in a comedic way. It's not correct usually to say "I wear the brains in this council", for example, but in this specific case, parallelism is used with the first sentence to provide comedic relief. For reference, English is my first language and I've been speaking it my whole life. I believe that often English learners take this comedic style too literally, missing the parallelism in the sentences that creates the humor. I respectfully disagree with any claims otherwise. "I wear the brains" doesn't make any literal sense. What she means is that she is the one who has the brains (i.e., she's the smart one) but she says it in a way that mirrors the words used by her husband, just because it sounds better. The whole point of this joke is that it is a parody of the oft-heard English saying, "to wear the pants in a relationship"; the cartoon is, amongst many things, mocking the idea that there is, can be or should be a "dominant" or "most important" part of any relationship, or indeed in any human collaboration. "To wear the pants in a relationship", in my experience, is used in English most often in the following three contexts: (1) to be (literal meaning) the male in a heterosexual relationship or, more generally, (2) to be (metaphorical meaning) a "dominant" partner or even (satirical meaning) (3) to have an overswollen sense of one's individual importance in a collaboration and probably a disregard for other people's contributions to that collaboration. Usages (2) and (3) are often alike when used in the third person, in that they both often have a strong whiff that the "pants wearer" is disrespectful of and lacking acknowledgement for the others who contribute to the relationship, be it a couple or otherwise. So, although one can't be exactly sure what a cartoonist is getting at, a likely implication of what's going on here is that the man is trying to "pull rank" (i.e. claim authority to have the final say on a decision), possibly because he happens to be the person who has the paid job in the family. The lady is making the point that it takes waaay more than money earning to make any endeavor to work, especially an emotional relationship. She is "wearing the brains", in other words, she is constantly thinking and planning how how family finances are going to meet the couple's needs and avoiding financial disaster, which is no trivial job. Indeed, her expression and the poignant paraphrasing of the dictum probably says she feels severely overstressed and overladen at having to be the one who always has to take this responsibility. The husband said "I wear the pants in the family" meaning that he thinks he's in charge in the family. But actually all it means is that he works. I'm not saying she doesn't - but this is a picture of some old people... where likely she writes the checks to pay the bills, etc. which makes her in charge because she's the brains. There's a joke about sending the husband to the grocery store that's along the same lines: Men will come home with $75 of toilet paper and hotdogs, where as she would have two weeks of gourmet meals planned. Since I don't think anyone has explained why it is funny... The point of the joke is that she is trying to say that she is the smartest of the two of them. However, the incorrect way she phrases it goes to show that she is probably not very smart. Not the answer you're looking for? Browse other questions tagged meaning jokes or ask your own question. What's the meaning of “get behind”? What does “the whole picture” mean? Could you please explain the sentences for me? What does “They'll run overseas'?” mean? What does “I'm partial to …” mean? What does “wrap around my head” mean? What does the man mean by saying this statement?